Ray Fisher (born September 8, 1987) is an American actor, who played on stage in the comedy The Good, the Bad, and the Confused, as Muhammad Ali in Will Power's play Fetch Clay, Make Man. 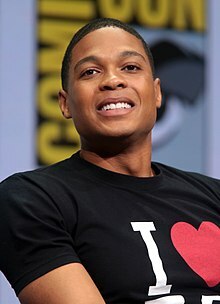 He is most known for his portrayal of Victor Stone / Cyborg in the DC Extended Universe appearing first in a cameo in Batman v Superman: Dawn of Justice (2016) and then in a lead role in Justice League (2017). Fisher is likely to reprise the role in his own standalone movie Cyborg set for release in 2020. Fisher was born in Baltimore, Maryland. He grew up in Lawnside, New Jersey and attended Haddon Heights High School. It was there that he was introduced to theatre by his high school English teacher. He was active in the school's theatre and choir program and sang in his church's choir. An English teacher introduced him to acting and he auditioned for a school musical in his sophomore year. After high school, Fisher attended the American Musical and Dramatic Academy in New York. In 2008, Fisher began performing in the Shakespeare Theatre of New Jersey's "Shakespeare Live" program, which presents professional theater performances at schools throughout the New York metropolitan area. He eventually obtained the role of Tom Robinson in the program's production of To Kill a Mockingbird, which he had first read in high school. On how he approached the role, he stated: "I tried to show his compassion. Here’s a guy who’s been in jail for seven months for a crime he didn’t commit. He’s had everything taken away from him. He can’t feed his wife. He can’t feed his kids. Yet he doesn’t badmouth anyone for what’s happened to him. Partly it’s because he can't. But I think that even when he’s alone, he doesn’t have bad thoughts about these people other than he’s sorry for them. That’s admirable. It’s a quality I wish I could say I had. I know if this happened today, I’d have a lot to say." In 2009, Fisher acted in William Shakespeare's play Macbeth at the Shakespeare Theatre of New Jersey in Madison, New Jersey at Drew University. Fisher gained 20 pounds of muscle in order to portray Muhammad Ali in the 2013 Off-Broadway production of Fetch Clay, Make Man at the New York Theatre Workshop in New York City going from 193 to 212 pounds. Fisher stated about his workout, "Ali never lifted weights. But he had a naturally bigger frame than I did, so in order for me to get to his size I had to lift — bench presses, curls, squats, calf raises. I had to get used to a new body." Fisher had a cameo appearance as the superhero Victor Stone / Cyborg in the 2016 superhero film Batman v Superman: Dawn of Justice. He reprised the role in the ensemble Justice League (2017), and will appear again in its sequel, as well as the upcoming film Flashpoint. He also has a contract to appear as the character in other films, including his own solo Cyborg film. 2015 The Astronaut Wives Club Captain Edward Dwight Episode: "In the Blind"
^ Winkler, Lisa (January/February 2012). "Ray Fisher: Actor". ^ Levine, Daniel S. (22 July 2017). "Ray Fisher: 5 Fast Facts You Need to Know". Retrieved 27 September 2017. ^ "DC's 'Cyborg,' Ray Fisher, didn't know he was getting his own movie". 21 October 2014. Retrieved 27 September 2017. ^ "Ray Fisher Workout Routine and Diet: Train like a Machine to become Cyborg". superherojacked.com. Retrieved 27 September 2017. ^ Kroll, Justin (April 24, 2014). "Ray Fisher to Play Cyborg In Batman-Superman Movie". Variety. Retrieved June 30, 2014. This page was last edited on 15 April 2019, at 12:41 (UTC).